Grover Hot Springs State Park is located on the east side of the Sierra at the edge of the Great Basin Province, characterized by open pine forest and sagebrush. The park has a hot springs, a campground, picnic area and hiking trails. Grover Hot Springs State Park is essentially open year-round, but is closed on Christmas, New Years and Thanksgiving Days. It is also closed for facility and pool maintenance during the last two weeks of September each year. Depending upon the weather conditions and type of repairs, the pools will normally reopen by October 1st. The facility also closes one day each in December, March and June for cleaning of the pools themselves. These days vary with weather and other seasonal activities and are announced during the previous month in local and regional news media. Finally the pools must close during major thunderstorms due to the possibility of lightning striking the water. Thunderstorms usually occur during the afternoon hours in the summer months of July and August. If thunderstorms are predicted by the National Weather Service for the Northern Sierra Nevada, then Grover will be affected. The pools will close when lightning is within one mile (5 seconds) of the complex and will remain closed until one-half hour after the storm has passed. The pools are open during snowstorms and even large blizzards. They may however be closed due to the inability of snow removal equipment to reach the Hot Springs Road. The pools are generally open every day from Memorial Day to Labor Day. In the off season, pool hours and days of operation are based on the funds available that year. As with any weather related recreation, calling the park prior to your arrival may save you an unnecessary trip. Call the park at (530) 694-2249 for current information. Why are the Hot Springs Green?The main reason for the color is the mineral deposits on the bottom of the pool. These mineral deposits are laid down on the surface of the paint by an oxidation reaction between the mineral salts in the water and the sanitizing agent (Bromine) used. To waterfall is 3 miles round trip; to Burnside Lake is 10 miles round tripwith 2,100-foot elevation gainNothing like a soothing soak in a hot spring after a long day on the trail. For the High Sierra visitor who wants to take a hike and ?take the cure? 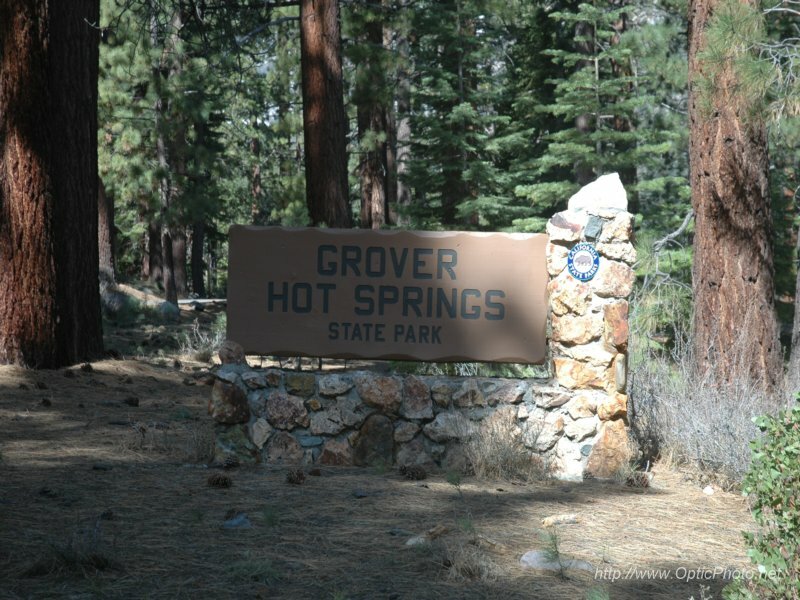 in the same day, Grover Hot Springs State Park, located a bit south of Lake Tahoe, is the perfect destination. Don?t expect a deluxe Euro-resort; Grover Hot Springs offers your basic soak, nothing more, nothing less. Bathers can sit in one hot pool (102 to 105 degrees) fed by six mineral springs, and one cool pool. The two pools and the changing rooms are the extent of the state park facilities. No, it?s not the concrete pools, surrounded by a wooden fence (the effect is rather like a backyard swimming pool installed in the 1950s) but the setting that?s inspiring at Grover Hot Springs. Tucked in Hot Springs Valley, surrounded on three sides by Sierra Nevada peaks, Grover Hot Springs offers a soak in a setting as soothing as its waters. The granite peaks, including 10,023-foot Hawkins Peak to the northwest and 9,419-foot Markleeville Peak to the southwest, form an inspiring backdrop to an area that?s been attracting visitors since the 1850s. Easy family hikes include a nature trail called Transition Walk that loops around the park?s alpine meadow and a three mile round trip walk to a waterfall on Hot Springs Creek. A more ambitious jaunt is the hike to Burnside Lake located in the adjacent Toiyabe National Forest. Burnside Trail crosses the state park, then ascends through a pine forest to the alpine lake. Grover Hot Springs is a all time favorite of our family. The pools are Awesome. Soaking in naturally hot mineral water is the best. Then add the spectacular scenery around it, and it is a MUST go to place.